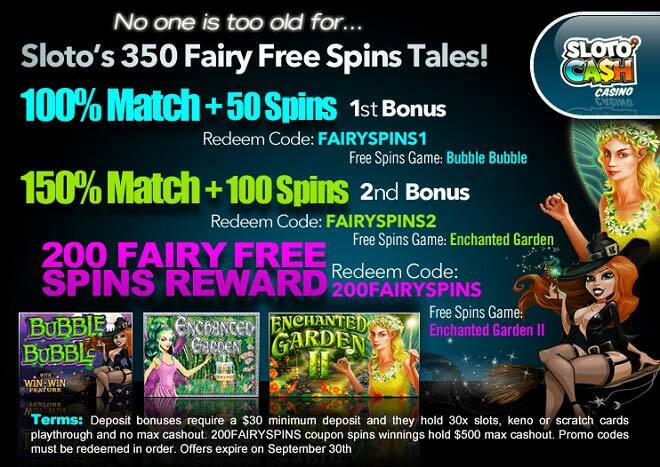 Believe in Sloto’s 350 Fairy Free Spins Tales! The best is yet to come this September if you choose to believe in fairytale endings and magical winning spells! Deposit as little as $30 and keep on believing in wins until September 30th! Invoke some magical wins when you first claim a 100% Match and 50 Spins that can be spun in our popular Bubble Bubble slot where Winnie the witch will be waiting for you to help you create some potions and turn them into wins. Step into our Enchanted Garden when you play with our 2nd 150% Bonus and 100 Free Spins! After claiming both bonuses you’ll have your happy ending this month when you spin our new Enchanted Garden II slot with an extra 200 Fairy Free Spins! 200 Fairy Free Spins Reward!